"WHAT IS A PHYSICAL DISABILITY?" There is a wide range of physical disabilities (PD) and those affecting pupils cover the whole ability range. Some pupils are able to access the curriculum and learn effectively without additional educational provision. They have a disability but do not have a special educational need. For others, the impact on their education may be severe. In the same way, a medical diagnosis does not necessarily mean that a pupil has SEN. It depends on the impact the condition has on their educational needs. There are a number of medical conditions associated with physical disability which can impact on mobility. These include Cerebral Palsy, heart disease, Spina Bifida and Hydrocephalus and Muscular Dystrophy. 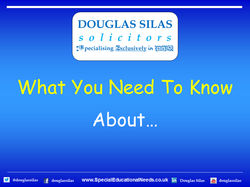 Pupils with physical disabilities may also have sensory impairments, neurological problems or Learning Difficulties. Some pupils are mobile but have significant fine motor difficulties which require support. Others may need augmentative or alternative communication aids.